After your flight into Accra, Ghana, our experienced guides will meet with you at the Kotoka International airport, from where you will go to your hotel in Anomabo, approx 2hours drive from the airport. After checking in you will spend the rest of the evening relaxing. Visit the Cape Coast Castle and take a guided tour to learn about the faith and last months of the men and women who where to be sent of as slaves to the Americas. This was where they spent their last days on the African continent. After Cape Coast Castle we continue to Kakum National Park, one of West Africa’s surviving tropical rain forests. Here you will have a walk among the treetops on the Canopy walkway which is made up of seven bridges extending 330m, hanging 30m (100ft) above the forest floor. There is an optional 2 km (1.2 mi) nature walk through this forest to discover the wide variety of exotic floral species and the medicinal values they offer or take a walk on the canopy walkway. After breakfast we drive to Kumasi (Ghana´s second city the seat of the Ashanti Empire to explore the legends of the famous Ashanti’s, whose legacies are still evident today.) We will visit the largest open market in West Africa – a true experience! After lunch, visit Manhyia Palace Museum, to obtain firsthand information on the legacies of the Ashanti kingdom. A regal history that dates back to 1700 is told with relics and artifacts. Enjoy a drive through the city with monuments dedicated to the memory of the great Ashanti people. In the afternoon we will drive to Lake Bosomtwe where we will spend the night. Here, in a twin village community, an eco-tourism and nature conservation project, the Mona Monkeys, Black and White Colobus monkeys, and humans live in harmony side by side. Because of the intimate relationship between the monkeys and the village people you have a good chance of close contact with the animals. We will also visit the monkey cemetery, where the dead monkeys are buried as humans. After breakfast check out of your hotel and embark on a drive further north. 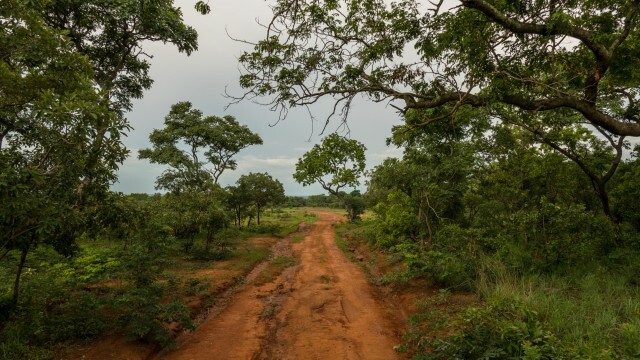 This drive takes you through the rural villages of Ghana – a true experience! On the way north we will stop at Kintampo waterfalls for a refreshing rest. In the afternoon we will reach Mole National Park to embark on an afternoon trek with an armed ranger to view West Africa’s big game: elephants, antelopes, waterbucks, warthogs, baboons, monkeys and more. Spend the evening overlooking the waterholes from the viewpoint at the motel. A full day of game viewing at both trekking with the rangers and from the viewpoint at the motel. Why not also spend some time either relaxing at the pool or just have a cold drink at the lovely restaurant. After breakfast, we leave for the ancient village of Larabanga, where you will witness the traditional way of life of the African rural communities, see the historic mosque and mystic stone situated in Larabanga. After Larabanga we continue to Tamale – capital of Northern region, where we will spend the night. In Tamale you can visit the arts market and hunt for a bargain to purchase souvenirs. We drive further northwards to Bolgatanga. We will stop to visit the beautiful hand painted huts of the villages Tongo, Tengzug and Sirigu if time permits us. Overnight in Bolgatanga just on the border to Burkina Faso. After breakfast we drive back to Tamale. After arrival you may spend the remainder of the day exploring the city. Tamale is now the largest fastest growing city in the northern of Ghana with a population of estimated 300.000. Some people call Tamale “the cities of bikes” – you will find out why when you arrive here! Overnight in Tamale. We will continue our journey by ferry. The ferry makes stops in most of the villages and are not only used for tourist, but also takes on yams and other goods for transportation to the markets in Accra and Tema. In fact, the ferry is primarily a cargo vessel that has a section with toilet and bath dedicated to tourists and local passengers. We will have cabins in this section to accommodate us at night, equipped with storey beds and AC as well as sink bay, and of course plenty of food and drinks on board. We will also make a stop at the Arts Centre where you will have an opportunity to use your bargaining skills to shop from an open-air market for artifacts from Ghana and West Africa. We will also stop for a visit to a coffin maker who specialized in different types of coffins (trucks, cows…). After this we will take you back to the Kotoka International airport for check-in and departure home or the next adventure. If you'd like, there is always the possibility to extend the tour with a relaxing beach stay at Anomabo Beach Resort. Please enquire with details about length of stay and type of accommodation for price.